You’ve probably seen this but its a document for educators containing Native American Values/Behaviors In School/University settings vs. non-native. This is a fantastic resource! Wopila for sharing! “Jesus H. Christ!” is the politest response I can come up with to that “comment”. We can start with that fact that I am not only a retired teacher who taught mostly marginalized populations in inner cities schools and rural areas, I was teaching elementary when NCLB came into being, I saw NCLB gut programs favoring those students because of test scores. There’s one small detail regarding those scores. In the case of my students, they were almost all second language learners who were forced to take tests in English, a language in which they were not proficient. The programs eliminated because of NCLB were programs attempting to address that lack of English proficiency by teaching them content in their native language while they were learning English so they wouldn’t fall behind. 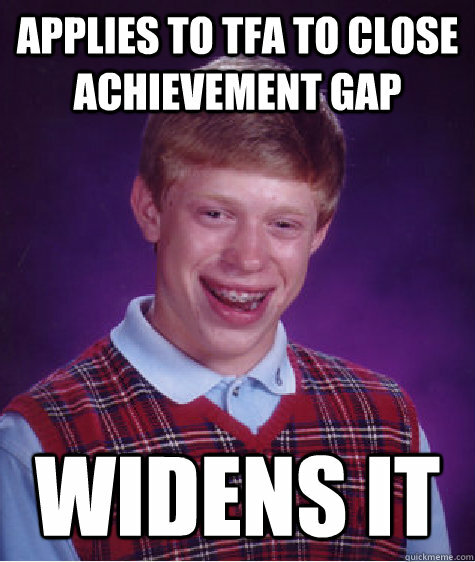 NCLB guaranteed that they would fail. And NCLB is the criteria that [expletive] cracker is using to criticize schools on the Rez? Give me a break! That asswipe has no business being anywhere near a Rez, much less teaching children there. He (or she, but I’ll refer to the teacher as “he”) more than proved he is the one who has “no desire to make changes”, i.e., to learn about the culture and then make cultural adaptations that might make more sense to those kids than his lily white world view. I hate that NCLB was so detrimental to so many kids. Thank you for service to those students; they were lucky to have you. And GREAT Trudell clip. Definitely required viewing. Thank you for this article. I hear a lot of these sort of comments from other white people in regards to Native Hawaiians and you explained the problem with them a lot better than I’ve been doing. I try my best to try to educate and be an advocate for the amazing kanaka ‘oiwi community here and the challenges they face, but its often hard to find the right words to respond!